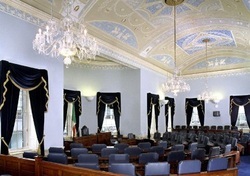 Nominating bodies are organisations that are connected to the particular vocation, for example the Irish Congress of Trade Unions can nominate in the Labour panel, and the Royal Irish Academy can nominate in the Cultural and Education panel. Who Votes? 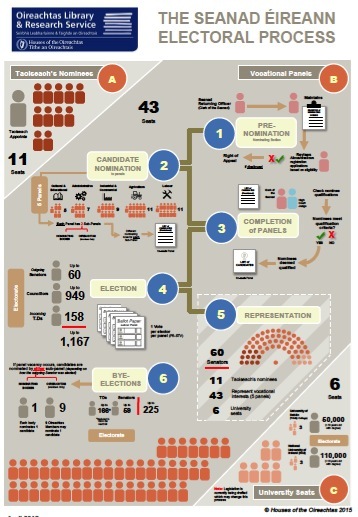 The electorate is restricted to elected Councillors, TDs and Senators the political parties have a great influence in the nomination procedures. Panels The composition of Seanad Éireann is defined in outline by Article 18 of the Constitution of Ireland, which provides for 11 appointees of the Taoiseach, six senators elected by the universities, and five vocational panels which together elect 43 members of Seanad Éireann, the upper house of the Oireachtas (parliament) of the Republic of Ireland. What does it mean by Sub panel?